The STAHLSCHLAG Industrial - Power Noise - Project was founded in February 2006. In 2007 it signed with the US-Label Telegrammetry/Hypervoxx and the label relaesed their first full time album "Acousticophobie" in April 2007. Between 2006 and 2009 some songs took part on various compilations like Extreme Sündenfall and Extreme Störfrequenz. 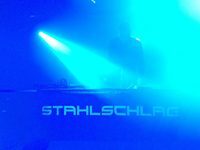 The style of STAHLSCHLAG is can be described as a mix of Industrial, Noise and Ambient sounds.